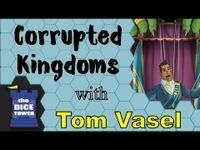 Corrupted Kingdoms is a fun strategy and negotiation game set in a fantasy world, where you take on the role of an evil corporate monster, fighting for power over the pathetic united kingdoms and its political elite. To advance your hidden agenda, and enrich the lives of your friends and associates, you will use your horde of minions to corrupt and subvert the assembly of the realm. Use the right kinds of "persuasion", increase your own power, and push backroom deals through the assembly, all while looting the kingdom and its people of all its worth. At the start of the game, each player will choose a fantasy corporation to play as (Dragons, Sorcerers, Giants, Witches, Vampires or Orcs), a Hidden Agenda which will guide their evil plan, and some starting minions (Zombies, Demons, Goblins, or Golems). Over the course of the game players will influence the assembly of the realm (Humans, Elves, Dwarves, and Gnomes) using their minions and influence. Propose bills through lobbying efforts, buy useless and pretty luxuries, and get the politicians who represent the (ahem) "people" to push their nefarious legislation into law.